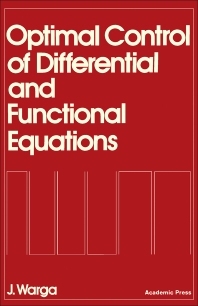 Optimal Control of Differential and Functional Equations presents a mathematical theory of deterministic optimal control, with emphasis on problems involving functional-integral equations and functional restrictions. The book reviews analytical foundations, and discusses deterministic optimal control problems requiring original, approximate, or relaxed solutions. Original solutions involve mathematicians, and approximate solutions concern engineers. Relaxed solutions yield a complete theory that encompasses both existence theorems and necessary conditions. The text also presents general optimal control problems, optimal control of ordinary differential equations, and different types of functional-integral equations. The book discusses control problems defined by equations in Banach spaces, the convex cost functionals, and the weak necessary conditions for an original minimum. The text illustrates a class of ordinary differential problems with examples, and explains some conflicting control problems with relaxed adverse controls, as well as conflicting control problems with hyper-relaxed adverse controls. The book is intended for mature mathematicians, graduate students in analysis, and practitioners of optimal control whose primary interests and training are in science or engineering.